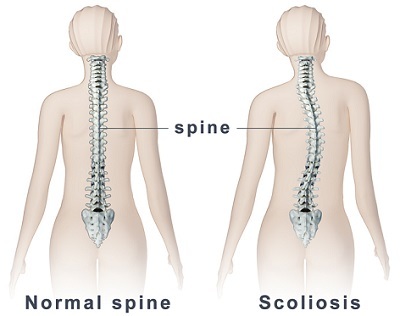 Scoliosis is the most common abnormal curvature of the spine. It is most common in adolescent females. Scoliosis is a genetic condition that frequently runs in families. Small curves usually cause no pain. The curve is commonly in the upper back. The patient may have one hip higher than the other, and frequently one shoulder blade appears more prominent than the other.